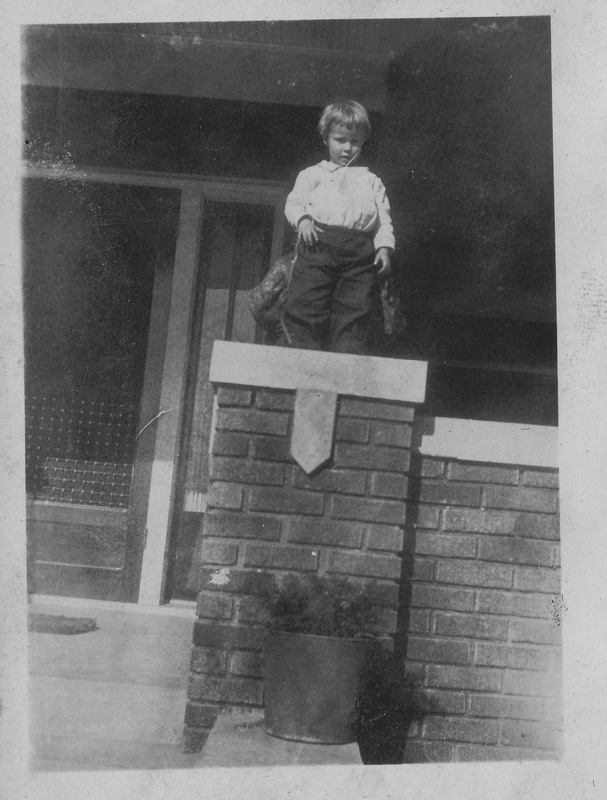 Sara on the bungalow porch, circa 1923. Probably being held by her grandmother, Bama. Another April Fool’s Day rolls around, bringing the promise of spring once again with the trees and the flowers just ready to burst. It’s safe to say that the same long-awaited promise of warm weather and laid-back days was just the same in 1921 as it is today. Sara loved her birthday, loved the intense color of it, the Easter bunnies and the dyed eggs, the smells and the tastes of early spring, even the gentle absurdity of being born on a day when pranksters have free reign. This would be her 94th, as hard as that is to believe. In her mind, I believe she was always about 8. 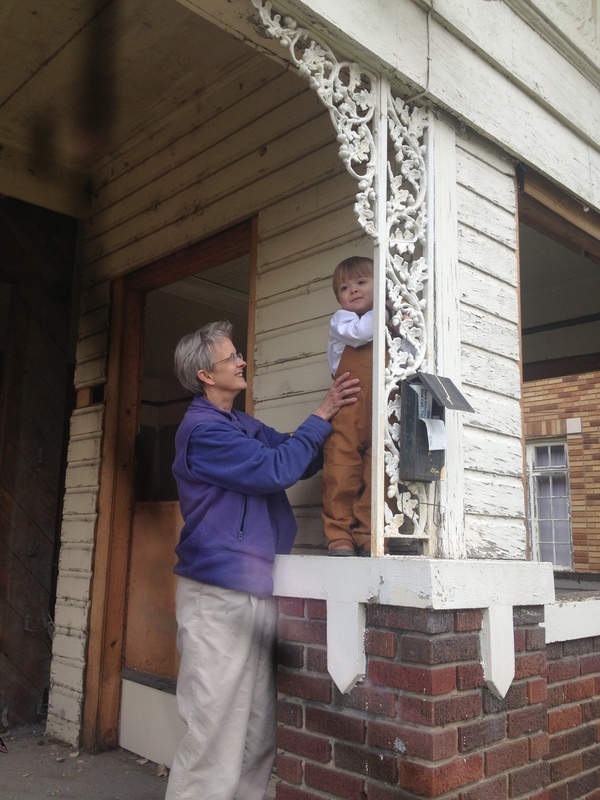 In that picture up there, she’s being held up on the sturdy brick column of the Strong Avenue bungalow’s porch. Those hands probably belong to Bama, Sara’s grandmother, who didn’t want to be evident in the picture for some reason. Bama was shy, according to Sara, and never really felt at home in Greenwood after a lifetime in Holmes County. But she shared that charming house on Strong Avenue with Sara, Mamie, Tiny, Howard and Jessie, claiming her own bedroom in the back. Something tells me she still didn’t have much privacy. Me and Henry Miller, aged 2, Sara’s first great-grandson. Same bungalow, same column, 92 years later. The bungalow is vanishing, board by board and brick by brick. Henry has explored it with all the curiosity and enthusiasm of a 2-year-old boy. He doesn’t yet understand the legacy of the 2-year-old girl who stood on that same column, with her own grandmother, all those many years ago. But someday he will. All our grandchildren will know that the cabin in the Holmes County woods where they will play and explore and someday bring their own children is the recreated bungalow, a gift from a long line of folks they never knew. Hello....I'm in possession of a priceless collection of memoirs and memorabilia left by my mother, Sara Evans Criss. She was a native and lifelong (88 years!) devotee of our small town, who covered this peculiar and volatile corner of the world for 30 years as the Memphis Commercial Appeal's Greenwood bureau chief, a job that started out with debutantes and high school football and wound up spang in the midst of one of the twentieth century's most enduring social upheavals. This blog is dedicated to her memory and the legacy she left behind, both for her family and her community. As always, very well said, Mom. I was hoping you would post those two pictures together. Happy Birthday to our # 1 April Fool…no # 2 has shown up yet today, but it’s only 9:00AM. Your grandmother would be thrilled to have Jack sharing her birthday, so we’ll keep our fingers crossed for some action on that front. Even if he waits another week, he’ll still be a very special addition to this family. We’ll take a picture with him, Henry and Charlotte, once that column comes back to life at West. Good times long ago, good times ahead.